We can’t say it enough: driving into floodwaters is the number one cause of flood-related deaths. The number two cause is walking into flood waters. It can be hard to accurately gauge the depth of water across a road. Scroll down and take a look at the photo below. How deep is the water? Maybe six or eight inches – just up to a normal car’s door sills, barely touching the underside of a truck? It’s green and murky from mud and vegetation, but the road doesn’t seem to slope down that sharply. It should be safe to drive through, right? Now roll your mouse pointer over the picture. Are you reconsidering your decision to forge ahead? Even a few inches of murky water can conceal many hazards: potholes, debris, even chemical or biological waste. A vehicle can slip off the edge of the road, puncture a tire, or become high-centered on a submerged log. For a pedestrian, those same hazards can cause serious injury or illness. 6 inches of moving water can knock an adult off his or her feet. 12 inches of moving water can move a light car. 24 inches of moving water can move a full-size pickup or SUV. Play it safe. 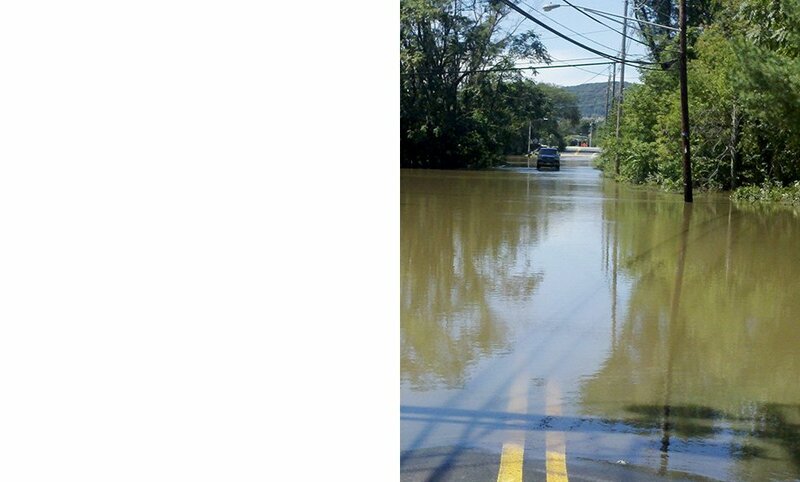 Turn around – don’t drown!